When I was traveling the world and blissfully unaware that my job as a celebrity interviewer at Microsoft was about to be eliminated, I was happy. Happy in the kind of way that puppies are when they spend an afternoon trying to get treats out of a puzzle ball. I was challenged, busy and ridiculously satisfied with myself when I got an entertaining nugget of a delicious interview with a celebrity. When my position was eliminated on that fateful day in May 2009 and after we lost the babies I curled up with my sedative of choice (orange mac & cheese) and thought "I am never going to be happy again. Ever." How do I go from jetsetting across the world doing a job I love to losing almost everything? I was humiliated, embarrassed, sad and hurt (physically and emotionally). I felt pummeled like a second-rate boxer in the third round. I was beaten. I knew it and I wanted the game called. Those hazy days that bled into one another. One of the worst feelings was that I didn't have purpose. I felt rejected. People who wanted to be my friend when I was interviewing Brad Pitt suddenly wouldn't return my emails or phone calls. I was a pariah. I doubted my skillsets. This is a bad emotional place to be in. It's a scary place. I felt like I was teetering on the edge of a cliff in a "Mission: Impossible" stunt. Then one day I decided I would write a blog. 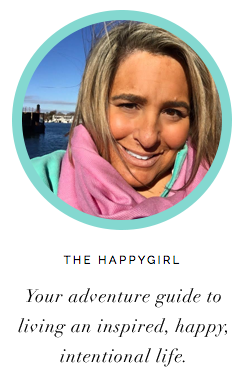 The blog would be called "The Happygirl Experiment" and I would see what it would take to get my happy back. I would interview experts, try products, do what it takes to get my happy back. The funny thing is that I was SO sad when I started. One early morning when I couldn't sleep I padded downstairs to my laptop and I knew I needed to write but I couldn't write anything. I stared at the screen. It's like the feeling of knowing you need to throw up because you'll feel better, but you can't do it. I started to sob. My husband came downstairs, saw me doing the ugly cry and asked what was wrong. I could barely get the words out. "I am not a happygirl. I am a SAD girl. This should be called The SAD GIRL Experiment! I know how to write that!" So I wrote the blog. I write the blog about the adventure of getting your happy back. It's been elusive, I see glimpses of it but yesterday, here in New York City at the BlogHer conference I found happy. Conferences can be dull, seminar after seminar, robotically moving from room to room and grabbing a quick sandwich on the way to another boring session. That is not BlogHer. 5am: Wake up to get organized for the day. Shower, ponytail. Read BlogHer updates for the day. 7:30am: Back at hotel, shower, change and head downstairs to start the day. 11:45am: Lunch Keynote featuring Martha Stewart and Elisa Camahort Page. Elisa's a gifted moderator and Martha is brilliant, funny, self-deprecating and honest. Elisa asked Martha a couple questions pre-submitted by BlogHer community members. One of those questions was mine. It blew my mind. 1:15pm: Attend seminar: "Ten Things You Can do Now to Maximize Your Social Media Expertise" with moderator Stacie Tamaki and speakers Nora DePalma and Chris Lam. 2:45pm: Expo floor. Swing by the Microsoft Windows booth to see if I know anyone there. Met the wonderful Jeannie Mai at the booth and we agree to follow up on Twitter. Stopped by booths of smart companies who love working with bloggers. Met Ree Drummond, The Pioneer Woman at the Land O' Lakes booth (LOVE the new olive oil and sea salt butter). Visit the Starbucks suite to see their new single serve drink machine coming this holiday season. 4:45pm: Voices of the Year Community Keynote. Bloggers are incredible. They are incredible. Their voices will lift you. 6:15pm: Ran over to the Room Key party on the rooftop terrace at the Dream Hotel. Talked with the founders. Love meeting passionate people who make their vision happen. 8:30: Back at hotel for the BlogHer party Sparklecorn. Yes, sometimes life is unicorns and rainbows. And cake. The day that I met a dad who is willing to fly to the moon if it means helping his baby boy survive. It's the day I met hundreds of new friends. It's like BlogHer brought together thousands of people just like you and said "Here, these are your people." I've met some amazing moms with beautiful children. I've learned coupon strategies and tips for soothing my baby's cries when someday I do have a soft little sunshine in my arms. I met military wives who are strong while their husbands are serving our country. I've made some wonderful new friends in the LGBT community. I learned from bloggers who write about politics, babies, finance, Disney, entertainment, fashion, food, law, birds, humor, health, love, bullying, cooking and travel. Today at BlogHer I learned techniques to help me become more efficient in my role as a blogger. I learned about integrity. I danced with the Rockettes and learned the secrets to doing the 'eye high kick'. I learned skills that will make me a smarter blogger and entrepreneur. I learned you can't take things personally. I learned that there are stories everywhere you look. I learned that bloggers are passionate and brilliant and hilarious and touching. Thank you to Elisa, Lisa and Jory and your extraordinary team who organized this incredible weekend. (By the way, GREAT job with the menus. THANK you for the healthy and gluten-free options!) Your team's touch was all over everything. Thank you to my fellow bloggers who showed me what it takes to be smart, empathetic and innovative. Thank you to the speakers here who shared your expertise with us. Thank you to the brands who recognize the passion of people who love what they do. Today I was happy. I felt challenged. I felt I was on my path. From these extraordinary women (and men) I learned that happy was in me all along. Here's to Day Two. When I wake up every day I say unimaginably good things are about to happen. They are.